Listed below, you will find the Village of Ridge Farm current water rates and policies. If you do not find the information you need, please contact our office and we will provide it for you. Should you experience a problem with your water, please call the Village Hall at 217-247-2239. We will do everything possible to locate the problem with your water. 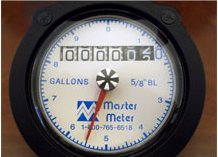 Water Bills are sent out are generated on the 1st of each month for previous months usage. Bills are due on the 15th of each month. Late Charges/Penalty Bills are applied on 16th. Penalty Bills are due by 8:30 am on the 26th of each month. Shut off for Non pay are the 26th or next business day.